Labyrinth is completely addicting action game fun. 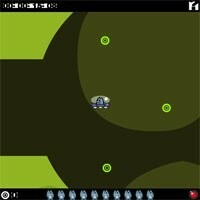 Can you escape from the Labyrinth in your rocket ship? Of course you can! Just make sure to steer clear of the walls as you race to find the exit and pick up some gems for good measure. Use arrow keys to move around. You have to find not only exit, but before that a lever that will open the door to freedom. Ten levels of good escaping fun.